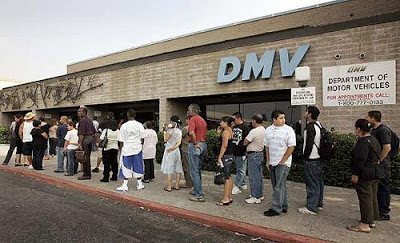 This is not my actual DMV, I found the picture here. So I had to go to them DMV today- you know, the Department of Motor Vehicles. Everybody loves the DMV, right? To make it interesting and so I would have something to blog about today I took my two youngest children and was sure to go just about an hour before I needed to pick up my kindergartner from school. Because I THRIVE under pressure. I was at the DMV for a really simple thing actually. I needed a one page, five dollar, printout of my driving record so I could drive on a school field trip. Technically this paper can be printed off at HOME from the WEBSITE but the school doesn't allow that because, "somebody could fake it." You know. Because parents who cook meth are always really eager to drive on field trips and are willing to actually change a government document in order to have the privilege of EXTRA screaming kids in their car. But for the sake of argument, this did actually happen. And they got to eat and spit out raisins onto the government run floor. Sadly, I DID NOT get put in the front of the line. Government bureaucracy is so much stronger than me. Depressing really. Anyway. I sat down among the other people at the DMV. (Why do so many of them look like vagrants or people who cook meth in their basement? Strange.) I notice the guy behind me chatting about his mother. Wait. Unless his mother's last name started with a FU and ended with an ER, he was NOT talking about his mother. I actually listened to this lovely human being chat about the "F" word and masturbation for about five full minutes. He really did have a set of lungs on him. I got the sneaking suspicion he wanted the people who worked at the DMV to hear what he was saying about them. "You should really watch your language around the children." And then I stormed off to the other side of the room with my children in tow. And the second miracle. I got my number called just in time to pick up my other daughter from school. Somebody was watching over me, even at the DMV. Hysterical! I love that yo were Mama Bear enough to confront the potty mouth behind you! Go you.